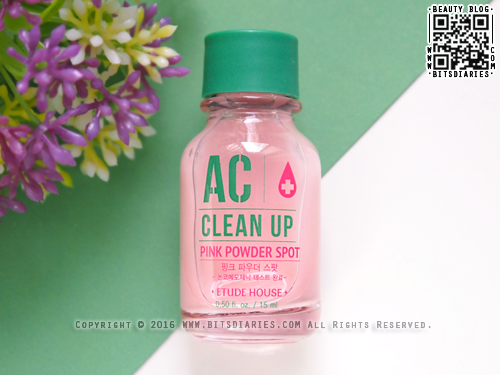 Etude House AC Clean Up Pink Powder Spot is a spot treatment with anti-inflammatory ingredients like salicylic acid, tea tree oil and madecassoside to combat spots and promote healing. This is specially formulated to be non-comedogenic to suit people with acne-prone skin. It is formulated with a 6-FREE system — Free of Animal Ingredients, Mineral Oil, Imidazolidinyl Urea, Triethanolamine, Tar Coloring and Artificial Fragrance. Fun Fact: This is a revamped version (new packaging + improved formula) of my all-time favorite spot treatment, Etude House AC Clinic Pink Powder Spot. 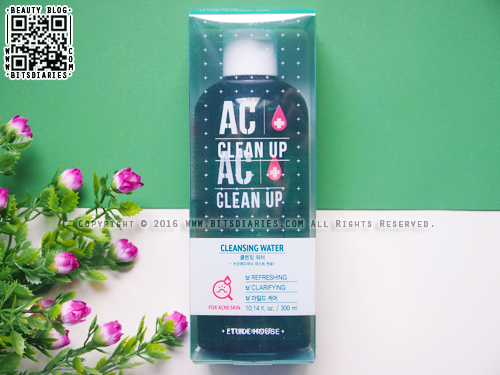 Formulated with salicylic acid, tea tree oil and madecassoside, Etude House AC Clean Up Cleansing Water is a water-based makeup remover specially designed for acne-prone skin. It not only thoroughly removes stubborn makeup, but it also buffs away dead skin cells and combats acne-causing bacteria, leaving your skin clean and refreshed. It is non-comedogenic, meaning it will not clog your pores. 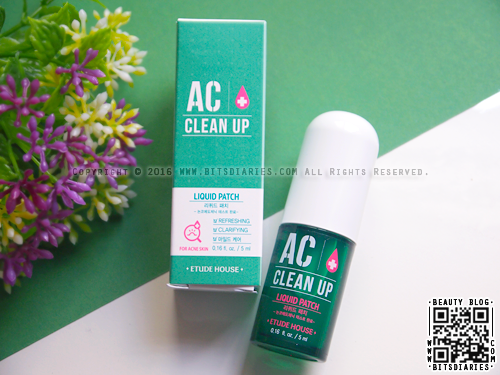 Formulated with Salicylic Acid, Tea Tree Oil and Madecassoside, Etude House AC Clean Up Liquid Patch fights against pimples, while providing a clear and thin protective film over pimples to protect them from direct contact with makeup and dirt. It is non-comedogenic, meaning it will not clog your pores.